A potential cost of polygyny that may have restrained its evolution in some avian species is the presence of extra-pair offspring in the nests of males mated with several females. However, this relationship is not frequently found and an experimental approach investigating the association between extra-pair offspring and polygyny, while controlling for male traits related to polygyny, has not been undertaken. 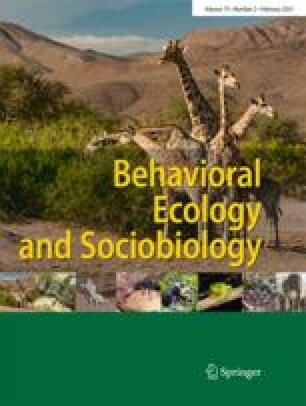 In this study, we manipulated the testosterone levels of facultatively polygynous spotless starlings, Sturnus unicolor, to establish experimentally different groups of polygyny and analyse its influence on levels of extra-pair offspring in males for which other traits were randomised. During two consecutive breeding seasons, we examined the effects of harem size on the ability of males to assure genetic paternity, assessed by DNA fingerprinting, and on reproductive success in their own nests. The frequency of extra-pair fertilisations varied between 10% (14/140) in 1996 and 20% (39/194) in 1997. Year-to-year analyses of extra-pair paternity variables with treatment as factor and harem size (number of simultaneous mated females) as covariate, were significant only in relation to harem size. Males with few simultaneously mated females were less cuckolded than more polygynous males in 1997 but not in 1996, indicating that mating costs of polygyny occurred, at least in the year with the higher rate of extra-pair paternity. Because polygynous males have more social mates, they may accrue higher reproductive success irrespective of their risk of being cuckolded. However, our results suggest that to be polygynous is costly in terms of paternity loss when we experimentally induce mating status controlling for individual male traits. However, the low values of our power tests for the statistically non-significant results of hormone on cuckoldry do not allow us to discard this hormone effect altogether. This study has been funded by projects PB94-0070-C02–01 and PB97-1249 (DGICYT, Spanish Ministerio de Ciencia y Tecnología). We are grateful to Eduardo Minguez who assisted in field work in 1996 and to Luís M. Carrascal for valuable statistical support. Two anonymous referees, Tatiana Czeschlik and José M. Aparicio made helpful suggestions. The study was undertaken under licenses of the Spanish General Directorate for Nature Conservation and by the Regional Goverment of Madrid.